Located in the Deep Bay in the north-western part of Hong Kong, Mai Po Nature Reserve is a wetland of international significance, and one of my favourite birding destinations! In addition to harbouring vast stretches of mangrove forests, tidal mudflats, grasslands and marshes, Mai Po is a major wintering ground for the endangered Black-faced Spoonbill, the critically endangered Spoon-billed Sandpiper, and a number of other birds. Birds aside, Mai Po is probably the only place where a species of firefly named after the- the Mai Po Bent-winged Firefly is found! (A caricature of this insect illuminates the title of the map). Mai Po is also an important heritage destination, as it is one of the few remaining places where traditional and manually operated shrimp ponds called Gei Wai can still be seen in use. Wonderfully designed observation hides make for some fantastic sessions of bird-watching, while the mangrove trails are a great way to spot the rare Leopard Cat and the Eurasian Otter! The reserve is managed by WWF Hong Kong. I was commissioned by the WWF HK's Education team to visit Mai Po in September last year, gather resource and reference, and create a bilingual illustrated map. The illustration is intended for display at the nature reserve, and also at various educational events conducted by the WWF. A big thanks to my friends at WWF- Alex, Augustine and Kitty for having me at Mai Po! 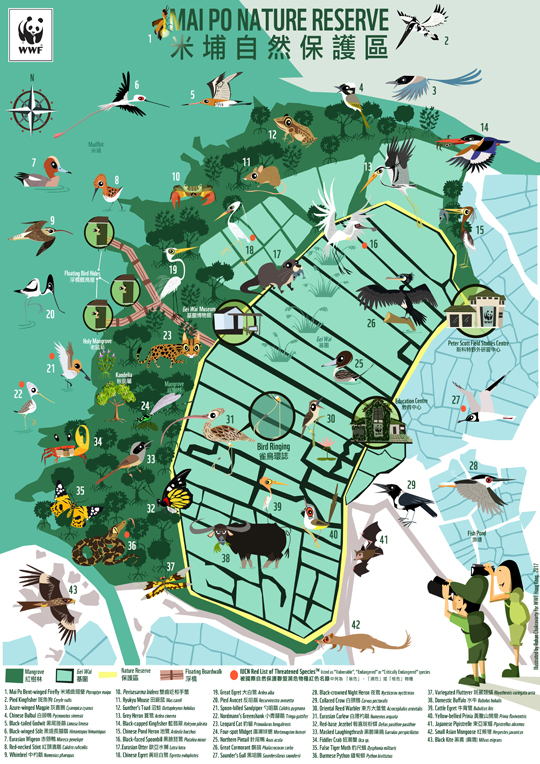 Also take a look at the Wildlife Map of Hong Kong, illustrated last year.